Maryland State House from our previous summer visit. The Maryland State House provides for a stunning focal point in Annapolis. As the oldest state capitol building in continuous legislative use, the structure has many stories to tell. The state house is perched on a circle. So, you can the stunning and regal architecture from many points in the city. The first state house on the location dated back to 1695. This first state house burned and a new one was completed in 1709. The 1709 state house was demolished and a third state house was constructed starting 1772. This state house would be updated and expanded upon over the years. So much history! Before entering the state house, I recommend touring the grounds to enjoy monuments and markers about. Above is the striking memorial to Justice Thurgood Marshall. One of my favorites is of Major General Baron DeKalb who fell in battle during the battle of Camden during the American Revolution. Another interesting element on the grounds is the Old Treasury Building which was constructed in 1735-1736. 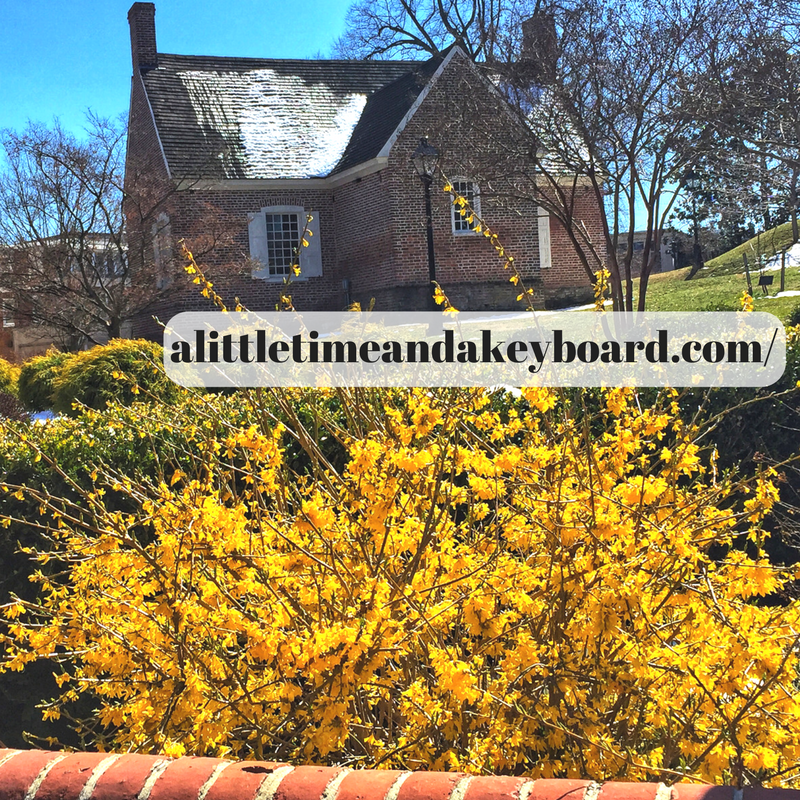 We loved the adorable brick building set behind a blaze of spring color. To enter the state house, adults will need to show valid ID and bags will be checked. Admission is free. After that, we were guided upstairs to the areas open for public viewing. There were more displays than I was expecting, each shedding light into the history of the structure and how it changed throughout time. I really loved the cutaway above showing how the rotunda was constructed. There also were interesting artifacts including a copy of George Washington's address resigning his commission after the American Revolution. I did not take a ton of pictures inside. I felt more in the moment just reading about the early influencers in Maryland and how the state house changed throughout the centuries. To me, the most impressive moment was standing in the room where George Washington gave his address when resigning his commission at the end of the Revolutionary War. You can definitely feel the weight of the moment in the room. It is said that General Washington cried during the address. General Washington giving his address resigning his military commission. General Washington gave his address in the Old Senate Chamber. Using a painting depiction from the period, the room was set up the way it most likely looked during the address. The statue of Washington stands where he stood to give his address. The access to this important site in history is incredible and I highly recommend making a visit. Many state treasures are also on display including the Maryland's silver. In a way, you almost feel like a dignitary yourself seeing all of these treasures! 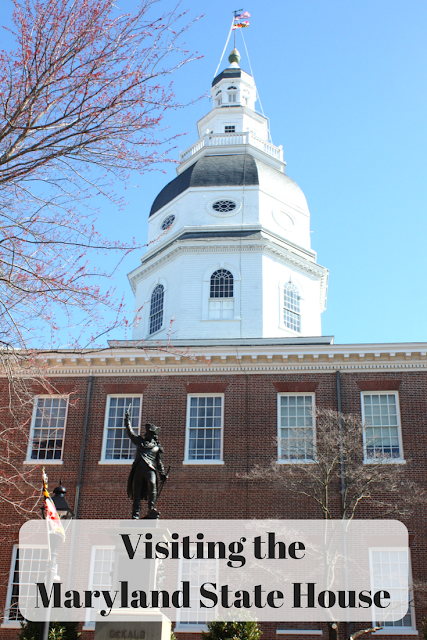 A visit to the Maryland State House is a fascinating addition to a visit to Annapolis. The history within the dignified structure is incredible. You can take tours, but I found that we learned quite a bit exploring on our own. One of my favorite adventures in Annapolis!